Molly Johnson, KPA CTP, had been training dogs positively for many years even before she attended the KPA Dog Trainer Professional (DTP) program in 2011. 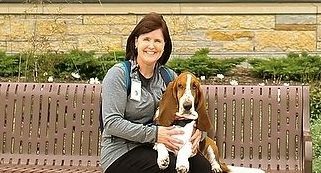 In that time, she developed an interest and expertise in training therapy dogs, particularly for work in the areas of grief, dying, and death. Molly’s skill set was augmented and enhanced by her participation in and completion of the DTP program. Interacting positively with therapy dogs, their handlers, and the various people therapy dogs visit results in significant comfort, love, support, and animal companionship offered to people of all ages. And, sometimes, Molly’s efforts yield astounding results! Finding human and canine therapy team members can be difficult, but having discussions with people about death and dying can also be taxing. Molly says that she loves her work, however. “I love what I do with all my heart and couldn’t imagine doing anything else with my KPA CTP skills.” In the past, Molly has worked as a volunteer director for a hospice and as the community outreach/grief and bereavement director at a funeral home. 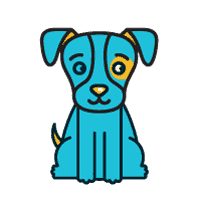 Her current business, Canine Comfort, LLC, grew from that experience. “Grief and loss have always felt very comfortable for me. My Dad died when I was 14 and all of my grandparents died over a seven year span before I was 23,” Molly shares. Working in the sometimes trying and emotional environments where Molly leads her therapy-dog training is difficult, of course. In hospice work, for example, the first challenge is assessing, and then matching, volunteers and therapy dogs. “I spend a lot of time interviewing people about their interest in working as a volunteer at end-of-life. We look for a very specific personality—warm, compassionate, caring, empathetic, an active listener, and, preferably someone who has had personal experience with hospice.” Molly says that when it comes to the dogs, they need “dogs that are exceptionally calm and polite, dogs that have great social skills and a long history of positive socialization.” In sum, “dogs that love people more than life itself. The KPA DTP program was life-changing for me. Looking ahead, Molly says that she and Fitzgerald William will be assessed (and hopefully selected) this summer for volunteer work as a crisis-response team for HOPE Animal-Assisted Crisis Response, a non-profit. Molly is interested in being both part of a therapy-dog team and a team leader. Molly describes the work as “responding on short notice with your dog to a crisis in a specified geographic area.” Crises may include a natural disaster, shooting, car crash, etc. “We’d be acting as a team to provide comfort and support to those affected, including the first responders and law enforcement personnel. If we are selected, I see a perfect opportunity to bring clicker training to a much larger audience,” Molly explains.